Register for After School Enrichment Scout Badge Class or your next Birthday Party today! We work in public and private schools throughout San Diego County. Enrichment programs are available after and during school hours. Classes run from four to ten weeks, and kids create a variety of bisque and glazed fired works of art. Clay Munchkins will come to your school, home, or other location and help your troops earn pottery badges and create their own unique clay pots and figures! Over the two sessions, Scouts get to learn about clay and where it comes from. The class will cover necessary terms needed to earn the badge. Break away from the basic parties and get a hands-on, fun, sensory filled and authentic ceramic experience! We come to your house or park and instruct an amazing creation. Children feel successful, empowered and confidant afterwards! San Diego based Clay Munchkins' objective is to guide children in the "hands-on" approach to create whimsical zoomorphic creatures out of natural clay. Students explore different techniques such as pinch, coil and slab-building with non-toxic lead free glazes. All of the work is fired in a kiln twice. Projects include animals from ants to zebras to bears to dinosaurs and every creature in between. 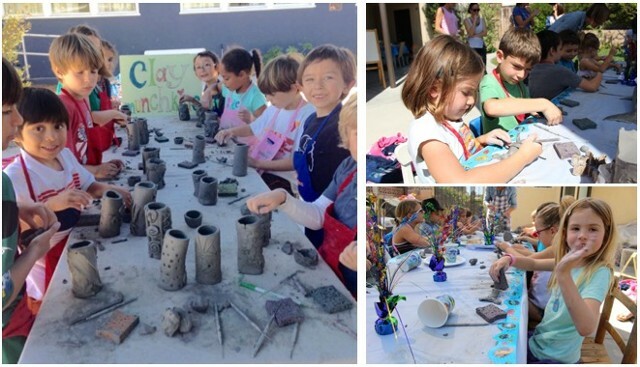 Clay classes help build self-esteem and push your child's imagination. They benefit the emotional, creative, intellectual and physical development of young children. The ceramic keepsakes are treasures for years to come. Clay Munchkins owner, Amy Mayfield, received her Masters of Education in Counseling and Guidance in 2018 from PLNU, and her Master of Fine Arts from The School of the Art Institute of Chicago in 2006. She has taught at The School of the Art Institute of Chicago and Lillstreet Art Center in Chicago. Her works have been shown in galleries in Chicago, New York, Berlin, Los Angeles, and San Francisco. A native San Diegan, Amy has owned Clay Munchkins for 10 years, and has worked for and part of the advisory board of The New Children's Museum and works with many museums throughout San Diego. She has redirected her passion from making art into teaching clay and other workshops to enrich and nurture children's innate desire to learn, create and experiment.